Many of our customers came to us because our competition could not meet their requirements. From Willman Industries, you will get a QUALITY casting that meets your requirements. Willman Industries pours all grades of Grey and Ductile Iron, including High Silicon Moly Ductile, Austempered Ductile, and all Meehanite grades of iron. We can pour castings from 1# to 40,000# in quantities of 1 to 10,000. Willman Industries is a SAFE-HAVEN Foundry. Our conservative approach to business allows us to stay in business. Unlike much of our competition, we have never faced bankruptcy! Your patterns are safe with us. A new generation of ductile irons has been developed by Willman Industries. These new grades produce higher strengths with even greater elongation. Willman offers state of the art 3d printing. 3d printing is revolutionizing the entire industry and you can get the very best. 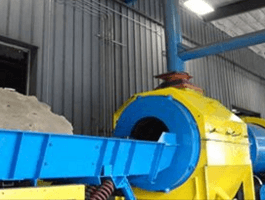 With our new Beneficial Reuse System, spent sand that was previously hauled away to the landfill is now recycled and used in projects such as road building and commercial building projects. Our first load of spent sand was recycled in September 2015. Willman Industries is a large, independent, cast iron foundry, located in Cedar Grove, 40 miles north of Milwaukee, Wisconsin. We produce all types of grey iron castings and ductile iron castings including Austempered Ductile Iron, Hi-Sil Moly and a full range of Meehanite grades. Whether you need high volume green sand castings or lower volume and tighter tolerance no-bake castings, we can handle your castings from ounces to 40,000 lbs. We are ISO 9000 Certified, and our casting quality has been certified by a number of our Fortune 500 customers including Caterpillar, Inc., John Deere, Case New Holland, etc. In addition, we have earned the coveted Meehanite MAC 2000 Quality Award for Excellence. We have thrived for more than 100 years as an iron castings manufacturer by producing your top-quality castings that other foundries could not make! You get the latest in foundry technology to produce high quality castings economically in any quantity you need. As a privately held company, we feel free to reinvest heavily in the business to stay on the cutting edge of casting practices so you will continue to get the very best even as the years go by. Our full range of add-on services beyond casting include product design, manufacturing, testing, maintenance, and after-sales support which allow you to come to one source for all your casting needs. We can handle your components from cradle to grave and you can have assurance the job will get done right because there is only one team responsible for the work. Our Willman Engineering Department (WED) engineered the gating and rigging of our equipment to ensure quality and consistency in every pour of your components. We control the metallurgy in the furnace, in each ladle, in each casting, and we of course check your castings before they leave the foundry. We continue to strive for excellence because we know you need high quality parts at the right price delivered on time, every time. Make your life easy but getting the best of all worlds when you call Willman Industries today about your castings.